Solbern has been designing and manufacturing processing equipment for the Food Processing Industry for over 45 years. 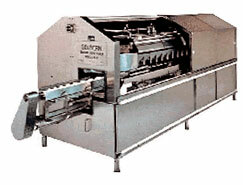 Our specialty has been container filling and pickle packing equipment. Recently, we expanded our product line to include the Solbern Burrito Folder, the Solbern Slab Slicer and Filler, and the Solbern Egg roll Folder.